All CIHF videos can be viewed here. Additionally, CIHF has recorded the talks given by guest speakers in the course Hospitality, Health, and Design Industry Immersion. The speakers share valuable insight on topics including: critical industry-related issues, potential career paths, and qualities conducive to successful business leadership. CHIF has recorded each guest speaker’s lecture and the complete video catalog of the course is available for anyone to view. Check out videos of the seminars here. Mardelle Shepley, Associate Director of the Cornell Institute for Healthy Futures and Professor of Design and Environmental Analysis, presents at the Cornell Family Fellows event, “Where Art, Science, and Technology Intersect – Fostering Innovation at Cornell,” on April 30, 2016. When campus leaders link art, science, and technology through interdisciplinary collaboration and experimentation, extraordinary advancements emerge. Senior-level executives, educators and leaders in senior housing and care discuss future challenges and opportunities. Speakers: Robert G. Kramer, CEO, National Investment Center for Seniors Housing & Care; Carol Cummings, senior director of Optimum Life Engagement, Brookdale Senior Living; John Rijos ’75, co-founder and operating partner, Chicago Pacific Partners; John DeHart ’96, co-founder and chairperson, Nurse Next Door; Melissa Ceriale, trustee, Montefiore Medicine; Esther Greenhouse, environmental gerontologist, Esther Greenhouse LLC; Patricia Will, founder and CEO, Belmont Village Senior Living; David Schless, president, American Seniors Housing Association; Jamie Huffcutt, health and wellness workplace strategist; Lynne Katzmann, president and CEO, Juniper Communities; and Cate O’Brien, director of research, Mather LifeWays. Maggie Hsu, chief of staff to the CEO of Zappos.com, discusses the company’s commitment to health and wellness programs at its new headquarters in Las Vegas during her keynote presentation October 10th at the Cornell Symposium for Hospitality, Health, & Design. Panelists discuss the incorporation of hospitality thinking in health care companies, Oct. 10, 2016 at the Cornell Symposium for Hospitality, Health, & Design. Featuring: Melissa Ceriale P’15, ’16, ’18, Board of Trustees, Montefiore Medicine; Andria Castellanos, Group Senior Vice President and Chief Operating Officer, NYP/Columbia New York Presbyterian; Robert Ritz MHA ’87, President, Mercy Medical Center; and Peter Yesawich SHA ’72, MS ’74, PhD ’76, Chief Growth Officer, Cancer Treatment Centers of America. Panelists discuss the consideration of service and healthy living in design, Oct. 10, 2016 at the Cornell Symposium for Hospitality, Health, & Design. 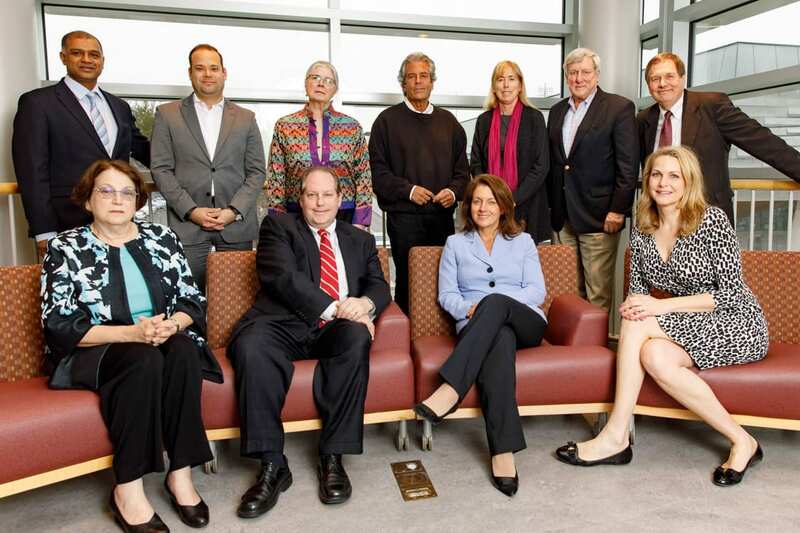 Features: Mardelle Shepley, Associate Director of CIHF; Jennifer Aliber, Principal, Shepley Bulfinch; Alan Dilani, Professor, Architect/Public Health, International Academy for Design & Health; Lancy Hosey, Chief Sustainability Officer/Principal, Perkins Eastman; and Naomi Sachs, Founding Director, Therapeutic Landscapes Network. Panelists discuss the adoption of healthier offerings in hospitality firms, Oct. 11, 2016 at the Cornell Symposium for Hospitality, Health, & Design. Featuring: Rohit Verma, Executive Director of CIHF; Alfredo Carvajal, President of Delos Signature; Jeff Hargett, senior corporate director at The Ritz-Carlton Leadership Center; Dayssi Olarte Kanavos SHA ’77, President and COO of Flag Luxury Group, LLC; and Rob Rush SHA’77, Managing Director in the Advisory Group of Deloitte & Touche LLP. Panelists discuss the need for more senior living facilities, Oct. 11, 2016 at the Cornell Symposium for Hospitality, Health, & Design. Featuring: Brooke Hollis, Associate Director, Sloan Program in Health Administration, Cornell University; Kelly Andress, President, Sage Senior Living; John P. Rijos, SHA ’75, Co-Founder and Operating Partner, Chicago Pacific Founders; and Joe Weisenburger, Vice President, Senior Housing, Welltower Inc.
Zig Wu MS ’11, Senior Program Manager, Space Management at Stanford Health CareHave you noticed a change in the design of your physician’s office or the updated look and feel of a hospital? It’s likely that Professor Shepley’s research and the tools that our panelists use have played a role in bringing about these changes. The panel will discuss the impact of academic research on space management and design and the importance of data analytics for space planning. Panelists will share thoughts on the implications of using technology for health care space and design programs and what technology can’t replace—consensus-building, decision-making skills, and the human connection. Alice Katz MBA ’76, President, The Vinca Group L.L.C. See other CIHF videos on CornellCast.